Carne Asada Steak Tacos with Fries have all your favorite carne asada fries flavors, in handheld form! 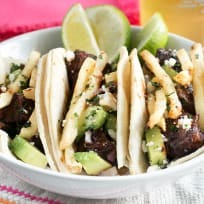 The spicy, rich carne asada steak will blow your taste buds away with complex flavors, piled underneath avocado, red onion, and most importantly… FRIES. Can you say taco party?! 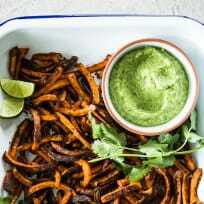 You only need three ingredients to make amazing Mexican sweet potato fries! The dip is super easy to whip up in your food processor, too. British fish & chips are a national treasure and there’s no denying their popularity. 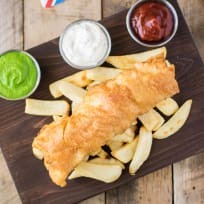 Fresh cod is beer battered then shallow fried to golden perfect and served with a side of thick cut chips and peas. Everyone loves French fries. 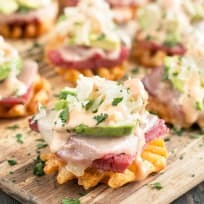 And we guarantee that everyone will love these unique ways to make French Fries! We all love to eat French Fries. But did you ever stop to consider the various ways in which you can put a unique twist on this snack? Baked chili cheese fries you can dig into all winter long without much guilt! Grab a cocktail and settle in with this comfort food extraordinaire. Herb & garlic oven fries are a delicious side to tons of different meals. They just happen to be naturally vegan, gluten free, and healthy too. Carne Asada Fries: Make It a Party! Carne asada fries are a crazy good way to amp up your regular ol' French fries. Create a toppings bar so everyone's version is unique. Jicama fries are a great twist on the traditional side dish. Lime juice and plenty of spices make them a perfect pairing with fajitas or a torta.